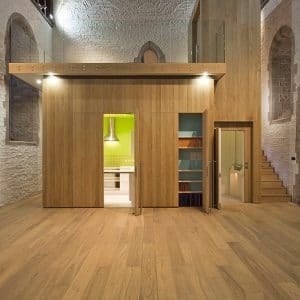 What can and can’t you do with listed buildings? Listed buildings are one of our greatest cultural assets. They are extraordinarily evocative places and to have them in our landscape is a genuine privilege. However, if they are to remain integral parts of our everyday lives, change is sometimes needed. We need to be able to use these treasured buildings in ways that suit our modern world not force us to live in the past. This need for change is something that Historic England, the public body that looks after England’s historic environment recognises. At the same time, it also recognises that any changes needs to be sensitive. the long-term consequences of the proposals can, from experience, be demonstrated to be benign, or the proposals are designed not to prejudice alternative solutions in the future. 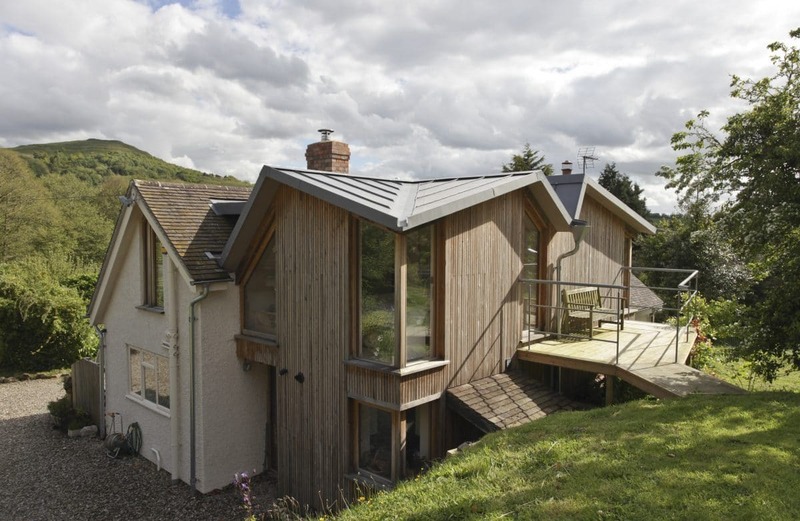 An eighteenth century Grade II listed timber framed building in the Malvern Hills had been extended in the late eighteenth century with further, less sympathetic, additions in the 1930s and 1980s. When a building is listed, it is the entire building that is listed, not just those parts that are deemed significant. In this case, this meant both the eighteenth century elements of the building and the unsympathetic 1930s and 1980s elements were listed. 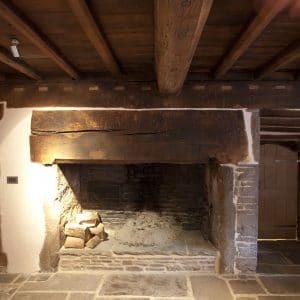 However, it was clear that original timber framed eighteenth century elements were the most significant and the 1930s and 1980s elements were less critical. 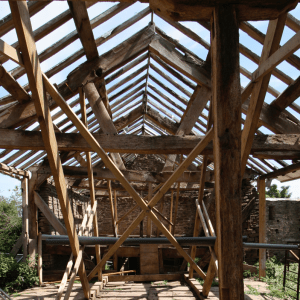 We made few changes to the original elements of the building and the changes we did make – such as exposing the timber frame to reveal the building’s oak skeleton – reinforced the significance of the building. The 1930s extension was in poor repair, so we removed the first floor and replaced it with a larch-clad building with an origami zinc roof. We adjusted the roof pitch of the 1980s extension, something that has two benefits. It means the roofline reflects and reinforces the steep pitch of the roof of the original timber-framed building. 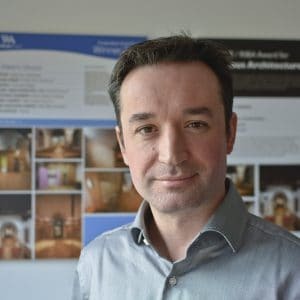 It also gives the building a stronger sense of narrative – the building has a story that has evolved through the centuries as it has changed to meet the needs of its inhabitants. For this project, the treatment of the shop door held the key to a solution that balanced the needs of the past and the needs of the present. The existing door, which dated from the mid-twentieth century, held little historic value. However, historical photos provided visual evidence of a significant Georgian doorcase. The Planning and Listed Building Consents on the building suggested returning the shop front to be reminiscent of its Georgian history. By doing this we could create an iconic and dramatic frontage that would perfectly reflect the shop’s brand and give a narrative to the historic story of the building. The photos we had showed the scale and form of the doorcase, but did not reveal the surface decoration. Two solutions initially presented themselves. A contemporary solution that created the drama of the doorway in the manner of its time or a historically appropriate solution based on photographic evidence, pattern books dating from the Georgian era and relevant examples locally. The first possibility could not be realised within the time frame. The second ran the risk of running into pastiche. The agreed solution was to execute the doorcase in a manner that remained as faithful as possible to the Georgian design and proportions as could be properly ascertained from the photographic evidence. However, since the photographs could not supply the evidence for the surface decoration for the doorcase, it was agreed that this should be where contemporary design should emerge. The final design of the shop front has evidence of its historic Georgian aesthetic, but it also is clear it is firmly of its time. 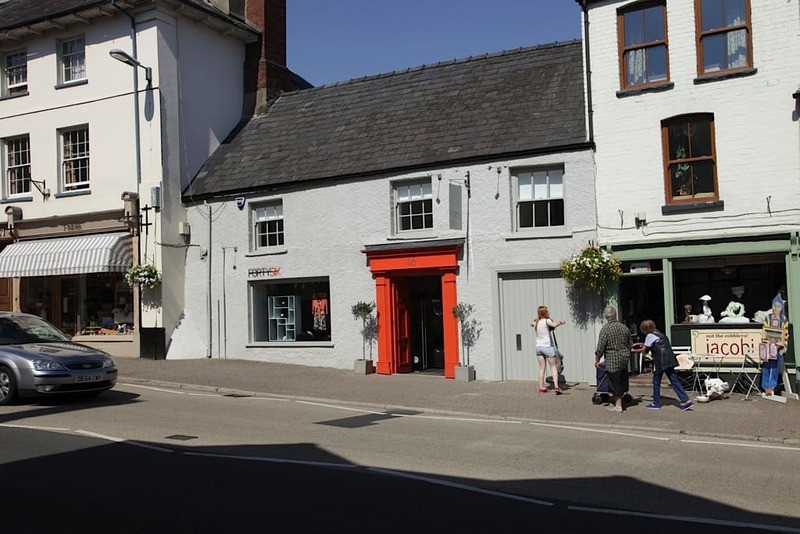 The door was finished in a bright orange lacquer from a historic paint range, in line with the shop’s new brand colours. 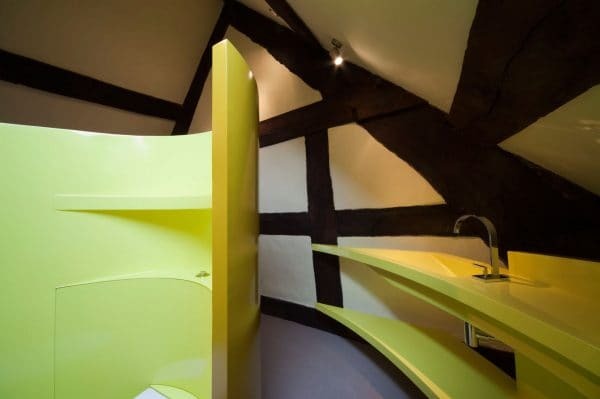 In this project, our client wanted to repair and conserve the Grade II listed fifteenth century cruck frame longhouse to preserve its historical significance but also create a comfortable, sustainable family home with three bedrooms and three en suite bathrooms. Two challenges presented themselves when it came to the creation of the en suite bathrooms. Firstly, the historical significance of the building and secondly the fact there was very little previous alteration at first floor level. 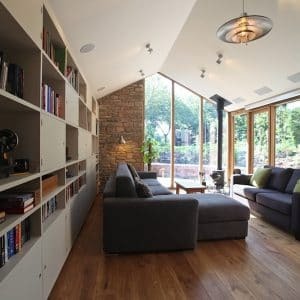 this meant that the normal approach to creating an en suite – subdividing an existing space – was not attractive and was considered to be detrimental to the building’s significance. 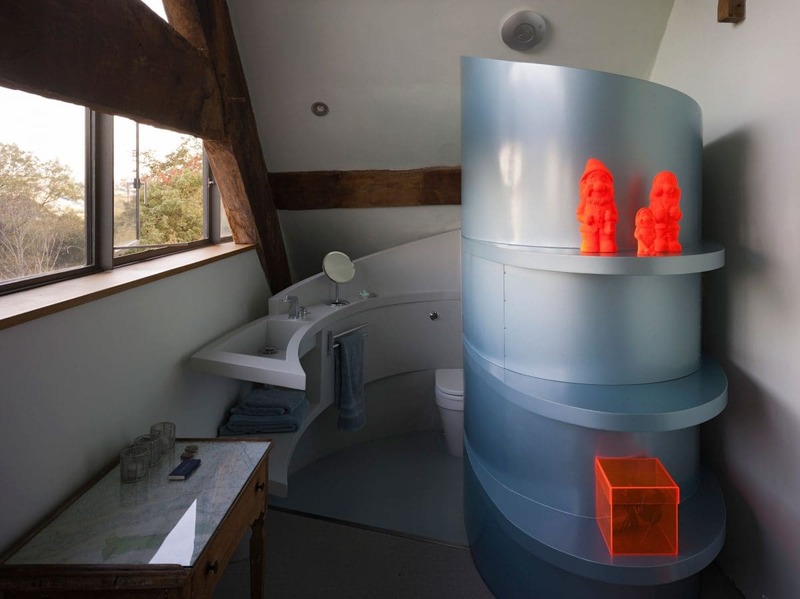 Our solution was to create three very contemporary freestanding bathroom enclosures. These were placed in the existing historical space and provided the facilities required while also maintaining the integrity of the significant space. The enclosures were objects in their own right and brought a sculptural element to the project. 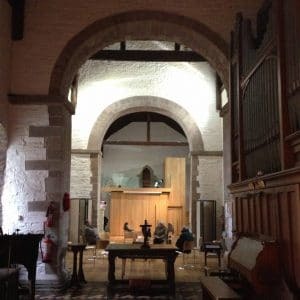 They would also allow the sensitive conservation and repair of the existing fabric by not ‘cluttering’ the surfaces of the historic building and could even be removed without any damage to the historic fabric should that ever be required. Historic and listed buildings are both joyful and challenging to work on. But when you carefully balance the needs of the past and the needs of the present you create an ancient building that has a new lease of life.